Thirteen fossil bones and teeth excavated in a cave in the Philippines represent an enigmatic previously unknown human species. Scientists said the Homo luzonensis species were probably small in stature and possessed an unexpected mix of archaic and modern traits. The remains of at least three individuals from this species were discovered in Callao Cave on the northern part of the island of Luzon. The find marked the second time this century that a bygone member of the human family has been found on southeast Asian islands. The researchers were unable to extract DNA but did determine that one of the individuals lived 67,000 years ago and the other 50,000 years ago. In 2003, fossils of another island-dwelling species - Homo floresiensis, dubbed the "Hobbit" due to its diminutive size - were unearthed in a cave on the Indonesian island of Flores, about 3000km from the Luzon site. There is no indication the two species interacted or were closely related. Homo luzonensis was a contemporary not only of the Hobbit but of our own species, Homo sapiens, which emerged in Africa roughly 300,000 years ago. The scientists said they could not rule out the possibility that the arrival of our species in the region contributed to the demise of Homo luzonensis. The "Hobbit" also disappeared about 50,000 years ago at the same time Homo sapiens was spreading through the region. 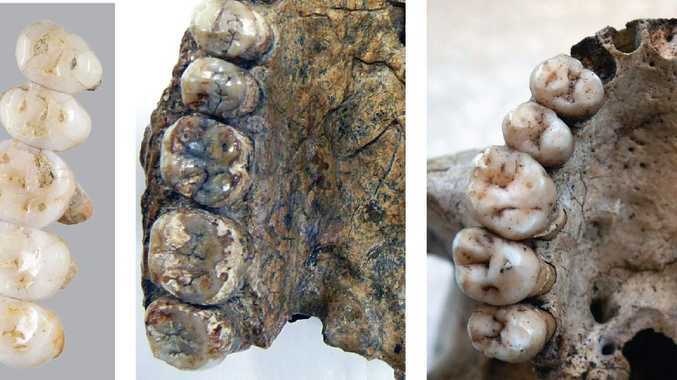 The researchers were circumspect in describing the physical appearance and lifestyle of Homo luzonensis, known only from a sparse assemblage of hand and foot bones, and teeth from two adults and one juvenile, with no skull fossils. Based on tooth size in particular, it appears it might have been much smaller than Homo sapiens, but it is unclear whether it was as little as the Hobbit, which was roughly one metre tall. Based on animal bones with butchering marks found at the site, it appears these people ate meat and may have used stone tools, Detroit said. The fossils from the seven-chamber cave, situated in the foothills of Luzon's northern Sierra Madre mountains, boasted a combination of anatomical features setting it apart from other human species.